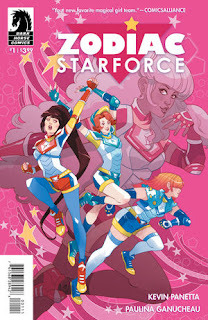 The Fellowship was fortunate enough to obtain a copy of ZODIAC STARFORCE #1 from Dark Horse Comics. Kevin Panetta writes, with Paulina Ganucheau on art and lettering and Savanna Ganucheau assisting with colors. It’s been two years since the Zodiac Starforce killed an evil goddess and saved the world. But now Emma runs into a monster in the school library and kills it (with a bit of help from Kim). The two of them meet up with Molly and Savanna at a party (rounding out the team) and in the course of the evening Emma faints. When the girls consult Astra (their own good goddess), they learn that the library monster did something to her. This book is a really cool take on the magical girl style of anime. It’s got plenty of the usual teenage drama, but the girls are also smart and funny (not to mention fiercely loyal to each other). The pacing of the story is perfect, and the art is splashy and colorful with amazing expression. I really got a kick of how well this issue sets up the team as veterans of the world-saving thing, then brings them back to being scared kids (I’m flirting pretty hard with spoilers here, but it’s great storytelling). You’ll definitely want to pick up this all-ages book. ZODIAC STARFORCE #1 is available now at your FLCS or at darkhorse.com.